Below you fill find all funeral homes and cemeteries in or near Baxter Springs. Suburbs of Baxter Springs: Baxter Spgs, Big Elk, Lowell, Sims. 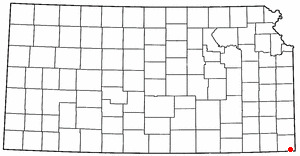 Baxter Springs is also known as: Cherokee County / Baxter Springs city. Their current mayor is Mayor Randy Trease. Zip codes in the city: 66713. Some of the notable people born here have been: Joe Don Rooney (guitarist and singer). Baxter Springs is a city in Cherokee County, Kansas located along the Spring River. As of the 2010 census, the city population was 4,238. It is the most populous city of Cherokee County.From an early trading post, the city grew dramatically with the expansion of cattle ranching in the West and was the first "cow town" in Kansas following the Civil War. its population grew dramatically into the early 1870s in association with the cattle drives. After railroads were constructed into Texas, cattle drives no longer were made to Baxter Springs and other points along the trail, and the towns declined.The city later had some economic success in the early twentieth century associated with lead mining in the area. The city protected its land, and owners and operators chose Baxter Springs for their residences and business offices. In 1926 the city's downtown main street was designated as part of the transcontinental U.S. Route 66 from Chicago to Los Angeles. By the 1940s, the high-quality lead had mostly been mined, and the industry declined. Some towns nearby disappeared altogether. Environmental restoration to correct damage left by mining has been underway for some time. It was revealed by Ellensburg Daily Record on November 28th, 2018 that Jack F Dover perished in Ellensburg, Washington. Dover was 85 years old and was born in Baxter Springs, KS. Send flowers to express your sympathy and honor Jack F's life. It was noted by Register Guard on November 5th, 2017 that Dewey Wayne Dooley passed away in Eugene, Oregon. Dooley was 79 years old and was born in Baxter Springs, KS. Send flowers to share your condolences and honor Dewey Wayne's life. It was written by Albany Democrat-Herald on December 16th, 2016 that Martha Lou Goebel (Pliler) died in Albany, Oregon. Send flowers to express your sorrow and honor Martha Lou's life. It was reported by Texarkana Gazette on October 20th, 2016 that Dorothy Marie Easley died in Simms, Texas. Easley was 91 years old and was born in Baxter Springs, KS. Send flowers to express your sorrow and honor Dorothy Marie's life. It was noted by Tri-City Herald on September 1st, 2015 that Robert Vernor "Bob" Bowersock perished in Richland, Washington. Bowersock was 86 years old and was born in Baxter Springs, KS. Send flowers to express your sorrow and honor Robert Vernor "Bob"'s life. It was written by San Mateo County Times on June 7th, 2015 that Beverly Smith (Versoy) passed away in Sunnyvale, California. Ms. Smith was 77 years old and was born in Baxter Springs, KS. Send flowers to express your sorrow and honor Beverly's life. It was written by Visalia Times-Delta on February 28th, 2015 that Lorena Marie Endicott (Sill) died in Santa Maria, California. Ms. Endicott was 89 years old and was born in Baxter Springs, KS. Send flowers to express your sympathy and honor Lorena Marie's life. It was noted by Galena Sentinal-Times on June 18th, 2014 that Opal Cathern Beyer (Jones) passed on in Baxter Springs, Kansas. Ms. Beyer was 86 years old. Send flowers to share your condolences and honor Opal Cathern's life. It was disclosed by Galena Sentinal-Times on June 18th, 2014 that James Richard Black perished in Baxter Springs, Kansas. Black was 69 years old. Send flowers to express your sorrow and honor James Richard's life. It was revealed on June 18th, 2014 that Kim Douglas Getman passed away in Joplin, Missouri. Getman was 54 years old and was born in Baxter Springs, KS. Send flowers to express your sorrow and honor Kim Douglas's life. When Texas established railroads later in the century, cattlemen did not need Baxter Springs, and the town had to struggle to find a new economy. Baxter Springs is a city situated along the Spring River (Missouri) River in the extreme southeastern part of Cherokee County, Kansas County, located in southeast Kansas, in the Central United States United States. They constructed corrals for up to 20,000 head of cattle, supplied with ample grazing lands and fresh water. The population was 4,602 at the United States Census, 2000 census, and it was estimated to be }} in the year . Texas cattle trade stimulated the economy and Baxter Springs grew rapidly. The official website for the city of Baxter Springs is http://www.lovesmalltownamerica.com/baxterspringsks.php. The campaign for the 3rd District seat in the Kansas House of Representatives is the most expensive ... He had 18 contributions of $500, including those from American Bank, Baxter Springs; Philip Morris USA; and the Empire District Electric Co.
Derfelt's Baxter Chapel provides complete funeral services to the local community. Listing all funeral homes in Baxter Springs, Kansas so you can easily send flowers to any location (same day delivery) or find any funeral service. We work with local florists and flower shops to offer same day delivery. You will find budget sympathy flowers in Baxter Springs here. Our funeral flowers are cheap in price but not in value. How Can I Be Buried with My Pet?